Cardiobacterium hominis and Cardiobacterium valvarum are well known, though rare, etiologic agents of infective endocarditis. Cardiac devices are increasingly implanted. Two cases of infective episodes in pacemaker (PM) treated patients with respectively C. hominis and C. valvarum are presented. In one case blood-culture bottles yielded growth of C. hominis at two episodes with two years apart. At the second episode a vegetation was recognized at the PM lead and the PM device and lead was removed. In the C. valvarum case, echocardiography revealed a bicuspid aortic valve with severe regurgitation and a more than 1 cm sized vegetation. The cases illustrate the diversity in disease severity by Cardiobacterium species. Careful follow up has to be performed in order not to overlook a relatively silent relapsing infection. Keywords: Antibiotic treatment, Cardiobacterium hominis, Cardiobacterium valvarum, Cardiac device, Infective endocarditis. The number of patients receiving implants of cardiac modulators is on the rise and recipients had an age-independent increase in comorbidities relative to the underlying population, especially over the past 15 years . Consequently, the challenge on possible infections related to cardiac devices, i.e. pacemakers and implantable cardioverter defribrillators also rises. The infection may include the electrical agent, the ‘tunnel’ in which the electrical lead is positioned before entry into the blood vessel (known as cardiac device infection [CDI]), or the electrode inside the blood vessel (known as CDE) . Cardiobacterium hominis and Cardiobacterium valvarum are slow-growing, fastidious, capnophilic, Gram-negative rod-shaped bacilli represented in the HACEK group of bacteria known to have the propensity to cause infective endocarditis [3, 4]. HACEK is an acronym for Haemophilus species, Aggregatibacter actinomycetemcomitans, Cardiobacterium species, Eikenella corrodens and Kingella species. In the case of C. hominis and C. valvarum, infective endocarditis is, with rare exceptions, their only pathological manifestation [2-4]. Two cases of infective episodes, in pacemaker (PM) treated patients, with respectively C. hominis and C. valvarum are reported. A 66-year-old woman was in May 2011 admitted to a local hospital in Denmark due to fever. She had a DDD-PM implanted in 1998 because of sick sino-atrial node and was additionally known with asthma, rheumatoid arthritis, and psoriasis. In 2007, she had her generator exchanged and since experienced periods of fever and had on several occasions received antibiotic treatment. On admission she had a temperature of 39,5° C and felt very tired. During the last 5-6 years, she had lost 40 kg without specific complaints. Blood samples showed a hemoglobin of 6,0 mmol/l, a C-reactive protein (CRP) of 99 mg/l and a normal leukocyte count. On suspicion of pyelonephritis, cefuroxime was initiated with good effect and she was subscribed 3 days later. Two out of 3 blood culture bottles gave growth after 4 days of incubation of what turned out to be C. hominis. The patient had 2 sets of renewed blood cultures taken, which also after 2 days of incubation yielded growth of what also turned out to be C. hominis in 2 of 3 blood culture bottles. Echocardiography (transthoracic (TTE) and transesophageal (TEE)) was without vegetations and without significant valvular diseases. The patient was transferred to a highly specialized hospital for the evaluation of suspected PM endocarditis. Repeated echocardiography showed a small vegetation on the pacemaker lead. Precipitating antibodies against Cardiobacterium species were determined by means of crossed immuno-electrophoresis and showed significantly increased values. The patient again received intravenous cefuroxime for two weeks and was then changed to intravenous ceftriaxone 2 g per day in two weeks after which she was afebrile. She was followed weekly for half a year and blood samples showed a CRP of 5-10 mg/l (Fig. 1) which was acceptable taking the rheumatic disease into consideration. Repeated blood cultures yielded no longer growth of C. hominis and it was interpreted that the infection had been successfully treated. The patient had in the mean time gained weight and was afebrile. At follow-up echocardiography, the small vegetation on the PM lead was however still present. Two years later, she was admitted again with pain related to the lungs. She was diagnosed with pneumonia and treated with amoxicillin+clavulanic acid 500+125 mg three times a day and CRP declined from 92 mg/l. However, a simultaneous blood culture grew C. hominis in one of three bottles and a new TTE revealed a 1.5x1.5 cm pending vegetation on the electrodes in the tricuspidal ostium. The patient was changed to ceftriaxone 2g once daily and the DDD-PM including electrodes were removed two days later. The electrodes as well as a tissue biopsy from the PM pocket remained culture negative. After two weeks the patient had three teeths removed due to chronic apical parodontitis and accumulation of leucocytes by leucocyte scintigraphy. In addition, pulmonary embolies were found further supporting the need for removal of the PM. After 10 days of ceftriaxone treatment, the antibiotic treatment was changed to amoxicilin 1g four times daily for another three weeks. At the end of antibiotic therapy a new DDD-PM was installed without complications. Fig. (1). 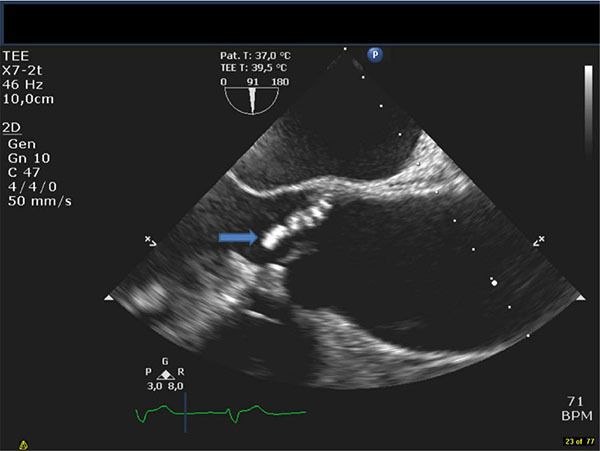 The figure shows a TEE long axis view of the aortavalve and ascending aorta. The arrow denotes the vegetation on the bicuspid valve. Case report no 2: A 72 year old male was admitted to hospital due to fever, sudden partial loss of vision and confusion. The patientwas known with ischemic heart disease with previous percutaneous coronary intervention in 2006 and a dual chamber pacemaker due to total atrioventricular block inserted in 2012. During the last 2-month the patient had experienced intermittent fever as well an unintended weightloss of three kilos. Initial workup included a cerebral CT scan that showed a subacute infarction of the occipital lobe and a culture negative spinal fluid. Initial antibiotics were ceftriaxone 2g and ampicillin 2g x 6 daily due to initial suspicion of meningitis. Later one of three blood culture bottles yielded growth of C. valvarum after three days incubation and treatment was changed to penicillin 3g x 4 daily and gentamicin 240 mg daily (dosing adjusted by serum-gentamicin concentration determinations). A TEE revealed a bicuspidaortic valve with severe regurgitation and a large vegetation sized more than 1 cm. The PM leads were without visible vegetations. Due to severe aortic regurgitation and cerebral embolization, the patient was transferred to a tertiary hospital for subacute surgical intervention. The thoracic surgeon found severe endocarditis on the bileaflet aortic valve as well as aortic root dilatation and replaced the valve with a stentless biological valve (Freestyle, Medtronic©). The PM was left untouched since no vegetations were found on the leads. To avoid nefrotoxicity, gentamicin was changed to ciprofloxacin and later moxifloxacin. Precipitating antibodies against Cardiobacterium species were determined by means of crossed immuno-electrophoresis and showed significantly increased values. The admittance was otherwise uneventful besides a post-operative pericardial effusion that resolved without intervention. At follow up the patient was without signs of infection and clinically well. Bacterial strains were recovered from blood samples using the Bact/Alert system (BioMerieux). One set of blood cultures consists of two aerobic and one anaerobic bottle(s). In case 1 all 3 sets yielding growth in aerobic blood cultures (2 out of 3 bottles) became positive after 2-4 days of incubation and in case 2 one of three blood culture bottles yielded growth after 3 days incubation. For all strains, microscopy of the blood culture fluid identified non-motile, Gram-negative, pleomorphic rods. When grown on 5% and 10% horse blood agar as well as on chocolate agar (Statens Serum Institut, Copenhagen, Denmark) incubated in ambient air supplemented with 5% CO2, the strains grew with colonies being 1 mm after 24 h incubation and with grey colonies sized 1–2 mm after 48 h incubation. Colonies were similar, being small, round, opaque, smooth, grey and glistening. There was slight α-haemolysis on blood agar plates. Strains were facultatively anaerobic. By conventional phenotypic tests the strains were found oxidase positive and catalase negative. Though not obtaining species defining score-values, by MALDI-ToF mass spectrometry the strain from case 1 was most probably identified as C. hominis (with a score-value of 1.824, 2 identical hits and a differenece of 0.615 til next best taxon match) and the strain from case 2 most probably as C. valvarum (with a score value of 1.517 and a differenece of 0.417 til next best taxon match). Partial 16S rRNA gene sequencing analysis was performed as described previously using the primers BSF8 and BSR534, which produce a 526 bp product . For the strain in case 1, a Max score of 808 was obtained for best taxon match which was C. hominis and more than 25 identical best taxon matches were listed before next best taxon match occurred which was C. valvarum and a Max score difference of 104 from best to next best taxon match was noted. For the strain in case 2 a Max score of 917 was obtained for best taxon match which was C. valvarum and 19 identical best taxon matches were listed before next best taxon match occurred which was C. hominis and a Max score difference of 239 from best to next best taxon match was noted. Antibiotic susceptibility testing was performed with E-test (BioMerieux). The following Minimal inhibitory concentrations (MICs) were obtained for the C. hominis strain: Penicillin G: 0.012 µg/ml, ceftriaxone: 0.023 µg/ml and for gentamicin: 0.125 µg/ml. For the C. valvarum strain the following MIC values were found: Penicillin G: 0.016 μg/ml, ciprofloxacin: 0.008 μg/ml, moxifloxacin 0.032 μg/ml and for rifampicin 0.032 μg/ml. The strains were interpreted as sensitive to the listed antibiotics. Cardiobacterium species are members of the normal upper respiratory flora in humans and may be found rarely on other mucosal surfaces [3, 4]. Before 2004, the genus consisted of only one species, C. hominis. However, a new species, C. valvarum, was identified as a novel species within the genus in 2004 [4, 6]. Almost all cases reported have been infective endocarditis or possible infective endocarditis. Although C. hominis was responsible for only 2 of 1989 cases of endocarditis from 13 published series, it accounted for 14 of 111 cases in case reports of endocarditis due to unusual organisms . Prosthetic heart valves were infected in 13%, all as late complications of the cardiac surgery. In approximately half of cases of infective endocarditis cases due to C. hominis, there had been a prior dental procedure or evidence of gingival infection. In case 1 the modified Duke criteria for diagnosis of infective endocarditis seems fulfilled as blood cultures gave growth of a typical causative agent in two different cultures taken at least 12 h apart. However, echocardiographical findings showed no definite vegetation(s) on the valves or the PM lead during the primary episode in 2011. However, the vegetation was relatively large at the second admission two-years later where the patient had signs of pulmary embolism and the PM and the electrodes had to be removed. That no growth of C. hominis was detected from the removed PM leads and device can be explained by the initiated antibiotic treatment prior to removal. As no vegetations were detected at the PM leads in case 2, only antibiotic treatment was chosen and the infective episode was successfully eradicated as long time follow up has been without relapsing episodes. A combination of antibiotic treatment and removal of the electrical leads and the device itself will be the most often recommended approach in clear cut episodes . The cases illustrate the importance of a careful echocardiographic examination giving the possibility of not having to remove the pacemaker device unnecessarily. However, though there are some reports of treatment only with antibiotics, which have been curative, most patients suffer an infective exacerbation with bacteremia, and severe complications necessitating surgical removal of the entire pacing system for cure, as in the second episode of case 1 [2, 3, 8]. This may be the result of biofilm production complicating eradication by antibiotics . In a study investigating marginal and subgingival plaque formation Cardiobacterium species were shown to be part of the plaques in smokers ; in case 1 chronic apical parodontitis was actually diagnosed and three teeth removed. In another study, investigating subgingival biofilms, presence of C. hominis was confirmed and correlated to aggressive periodontitis in the absence of certain other oral bacteria . Whether a new infection was causing the vegetations in case 1 or it was a chronic biofilm related infection is unclear. A revolution in diagnostic microbiology has recently occurred with the introduction of MALDI-ToF mass spectrometry . The accuracy, the speed, the relative easy performance protocol and low costs are strong arguments for its use. HACEK bacteria, including Cardiobacterium strains have been accurately identified to the species level (>98%) even for very closely related species . The MS identification was also very presumptive for our strains though not conclusive. In a study on 11 Cardiobacterium strains of which 4 belonged to C. hominis and 7 to C. valvarum, short (526 bp) and near full-length (1399 bp) 16S rRNA gene sequence analysis convincingly allocated the strains to either C. hominis or C. valvarum . Phylogenetic trees based on 16S rRNA gene sequence analysis clearly divided the examined strains into the two species. Thus, in our case as well MALDI-ToF MS and 16S rRNA gene sequence analysis supported the concluded identifications. Cardiobacterium strains are sensitive to penicillin and most other beta-lactams, in addition to aminoglycosides and quinolones [3, 4], as also seen for the strain examined in this case report. According to the latest Guidelines on the prevention, diagnosis, and treatment of infective endocarditis (new version 2009)  treatment of non-beta-lactamase producing HACEK infective endocarditis cases, intravenous ampicillin/penicillin plus gentamicin for 4 weeks is an option. The present cases illustrate the diversity in disease severity by Cardiobacterium species. Though, PM devices were present, no definite device related vegetations were recognized. Therefore removal of the devices was avoided and the patients were successfully treated with relevant antibiotics. It stresses the importance of careful echocardiographic examinations when deciding treatment strategy. However, in the C. hominis case a relapse/reinfection episode with C. hominis occurred two years later with a vegetation present on the PM lead and the PM device and lead was removed. Long lasting careful follow up has to be performed in order not to overlook a relatively silent relapsing infection. Uslan DZ, Tleyjeh IM, Baddour LM, et al. Temporal trends in permanent pacemaker implantation: a population-based study. Am Heart J 2008; 155(5): 896-903. Edelstein S, Yahalom M. Cardiac device-related endocarditis: Epidemiology, pathogenesis, diagnosis and treatment - a review. Int J Angiol 2009; 18(4): 167-72. Lang SD, Morris AJ. Cardiobacterium hominis. In: Yu VL, Weber R, Raoult D, Eds. Antimicrobial Therapy and Vaccines. New York: Apple Trees Productions 2002; pp. 173-8. Nisbet M, Lang SD. Cardiobacterium species In: Yu VL, Weber R, Raoult D, Eds. Antimicrobial Therapy and Vaccines. New York: Apple Trees Productions 2002; p. 73. Christensen JJ, Andresen K, Justesen T, Kemp M. Ribosomal DNA sequencing: experiences from use in the Danish National Reference Laboratory for Identification of Bacteria. APMIS 2005; 113(9): 621-8. Han XY, Meltzer MC, Woods JT, Fainstein V. Endocarditis with ruptured cerebral aneurysm caused by Cardiobacterium valvarum sp. nov. J Clin Microbiol 2004; 42(4): 1590-5. Ben-Chetrit E, Nashif M, Levo Y. Infective endocarditis caused by uncommon bacteria. Scand J Infect Dis 1983; 15(2): 179-83. Nurnberger M, Treadwell T, Lin B, Weintraub A. Pacemaker lead infection and vertebral osteomyelitis presumed due to Cardiobacterium hominis. Clin Infect Dis 1998; 27(4): 890-1. Santos AP, Watanabe E, Andrade Dd. Biofilm on artificial pacemaker: fiction or reality? Arq Bras Cardiol 2011; 97(5): e113-20. Kumar PS, Matthews CR, Joshi V, de Jager M, Aspiras M. Tobacco smoking affects bacterial acquisition and colonization in oral biofilms. Infect Immun 2011; 79(11): 4730-8. Lourenço TG, Heller D, Silva-Boghossian CM, Cotton SL, Paster BJ, Colombo AP. Microbial signature profiles of periodontally healthy and diseased patients. J Clin Periodontol 2014; 41(11): 1027-36. Seng P, Drancourt M, Gouriet F, et al. Ongoing revolution in bacteriology: routine identification of bacteria by matrix-assisted laser desorption ionization time-of-flight mass spectrometry. Clin Infect Dis 2009; 49(4): 543-51. Chen M, Kemp M, Bruun NE, et al. Cardiobacterium valvarum infective endocarditis and phenotypic/molecular characterization of 11 Cardiobacterium species strains. J Med Microbiol 2011; 60(Pt 4): 522-8. Habib G, Hoen B, Tornos P, et al. Guidelines on the prevention, diagnosis, and treatment of infective endocarditis (new version 2009): the task force on the prevention, diagnosis, and treatment of infective endocarditis of the european society of cardiology (ESC). Eur Heart J 2009; 30(19): 2369-413.